Minister of Defence Abdel Fattah El-Sisi called on Egyptian political powers to look to reconciliation and understanding in order to protect Egypt in a speech on Sunday during a military lecture held by the armed forces at Galaa Theatre. "The armed forces are calling on everyone to find a way of understanding, consensus and true reconciliation in order to protect Egypt and its people; we have time (a week) to achieve a lot," said the minister in a speech that was published on the official Facebook page of the Egyptian army spokesperson. Next week, mass anti-government rallies by a variety of opposition groups are planned for 30 June. Islamist groups that support President Morsi have declared they will hold rival rallies in support of the beleaguered president. "The armed forces have avoided politics in the past period, yet the national and moral responsibility of the forces towards their people obliges them to intervene to stop Egypt from slipping into a dark tunnel of civil fighting and killing, or sectarianism, or collapse of the state institutions," said El-Sisi. The minister hinted that there is spilt in Egyptian society that will be dangerous if it continues. He also added that the Egyptian armed forces were fully responsible for protecting the Egyptian people's will. 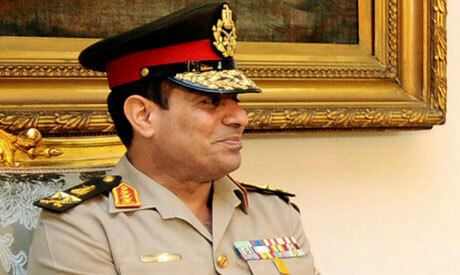 El-Sisi also stated that the armed forces will not be silent in front of the attempts to scare and terrorise Egyptians. He added: "The army's bond with the people is eternal. Those who think they can infiltrate this bond or circumvent it are mistaken. The armed forces will not stand silent any longer against repeated insults to the institution and its symbols. I hope everyone realises the repercussions this discourse could have on Egypt's national security." Egypt's military forces, which assumed power for 18 months following the 25 January 2011 uprising that toppled Hosni Mubarak, faced criticism over several protest crackdowns during its rule. Critics have also accused the army of striking a "safe exit" deal with the Muslim Brotherhood before the June 2012 presidential elections from which Mohamed Morsi, who hails from the Brotherhood group, emerged as Egypt's first civilian president. In Latin America during the 1950's and 1960's, liberals usually supported the military against governments preceived to be ideologically radical. They hoped by this way to get to power themselves. What really happened: as soon as the military deposed those governments, soon after the liberals were also sidelined, put in jail, sent to exile or worse. If Egyptian liberals hope the military will share power with them after a coup, they are delusional; it will be political suicide. And let no one say it was a surprise.